You can now see which chats end with sales thanks to the new Sales Tracker. Add it to your product pages to monitor when a chat leads to a successful checkout. Whenever a customer makes a purchase after a chat, all the transaction information like order ID or order value will be added to the chat thanks to the Sales Tracker. You can look it up in your Archives or check out the big picture in the new Sales Report. 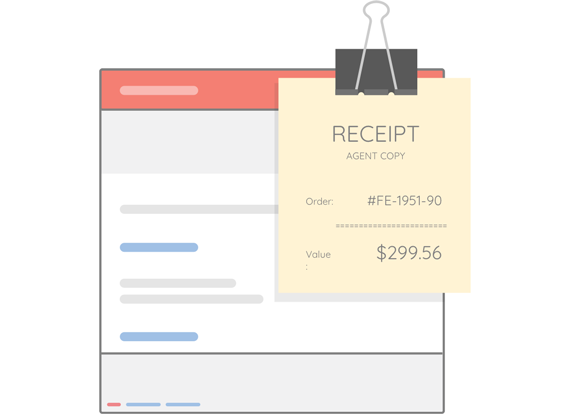 These will help you see which agents, pages and products bring in the most revenue! Monitor these metrics, make tweaks to your sales funnel and see how much you can improve week over week with the new Sales Tracker. For more information, head to our Sales Tracker guide. Automate Your Email Marketing: Autopilot Integration Is Here! LiveChat Autopilot integration is here, allowing you to follow-up your customers right after a chat conversation. Automate your email marketing and close more of your hot leads in the process! 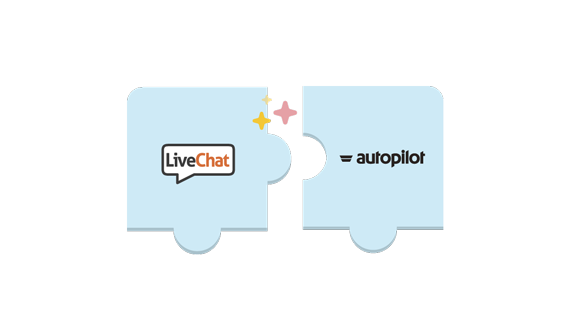 LiveChat Autopilot integration: how does it work? 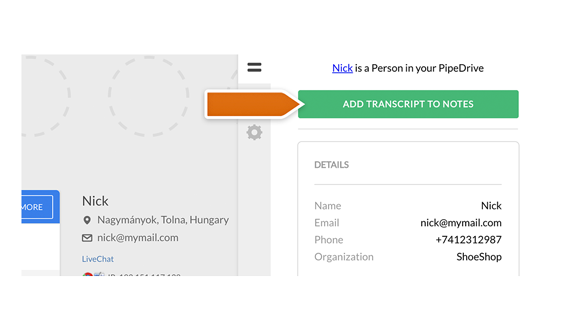 With Autopilot integration you can now automatically add new contacts to your journeys. To do that, simply tag a chat with your customer and we will do the rest for you. What’s more, you can specify which tag should trigger a journey in your Autopilot. LiveChat will also equip each of your new contacts with the information gathered from your pre and post-chat surveys. Click here to check out our official Autopilot tutorial. Also, don’t forget to leave a comment below – we would love to hear from you! Keep Your Internal Knowledge Base Right in LiveChat Application! 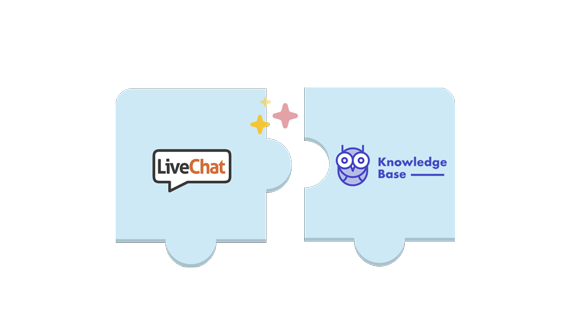 LiveChat Knowledge Base is here, giving you the possibility to create your internal knowledge base and access it straight during a chat! Give your agents the possibility to use the Knowledge Base whenever they stumble across difficult questions from your customers. And all of that without leaving your LiveChat app! So how does LiveChat Knowledge Base work? It’s quite simple! All you have to do is to install the integration and add your first article. What’s important, both of them can be done without leaving your LiveChat app – it’s that easy! But there’s more! Out of the box, we provide you with a series of articles, guiding you through both: installation process and your Knowledge Base management. Click here to check them out! The integration is currently in beta, and you can test it for free until the end of 2017. Don’t worry though – we can confirm that it is stable. What’s more, we are planning to extend the Knowledge Base’s functionality with some exciting new features, so stay tuned for more updates! A whole new way to customize your LiveChat is now available! The Apps Marketplace gives you the option to choose which custom features, additions and integrations you want to add to your LiveChat. Right now, Owners and Administrators can use the Marketplace to pick and choose from all of LiveChat’s integrations with various 3rd party tools but more options are coming! Make sure to check out the Apps Marketplace yourself. In other news, we’ve also added better notifications for the number of new tickets and the number of online visitors. They now both look like the notification for the number of chats which is a lot clearer and easier to read. Get into the Holiday spirit and choose one of the 12 new holiday-themed eye-catchers. There are 6 spooky eye-catchers for Halloween and 6 merry ones for Christmas. 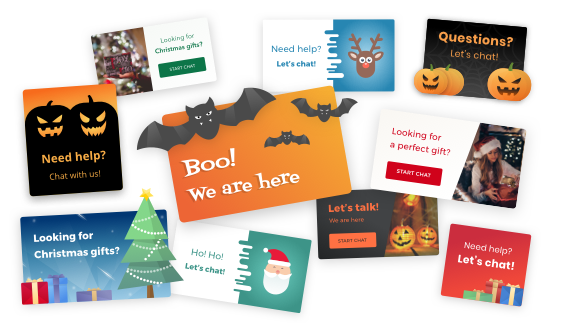 Your customers won’t be able to resist to click them! Check out the new eye-catchers and change yours for the upcoming Holidays! CoBrowse with your customers: Median integration is here! Looking for a quick and easy way to manage a CoBrowsing session with your customer? Look no more. LiveChat – Median integration is here, making it both easy and convenient to see exactly what your customers are looking at! LiveChat – Median integration: what it’s all about? Being your customer’s additional pair of eyes can genuinely make a difference. From spotting an unusual behavior of your application to guiding your customer through a checkout process, CoBrowsing session can speed things up. Combine that with one of the most versatile LiveChat tools on the market, and you’ll see that there’s no better way to impress your customers with exceptional service. Click here to check out our official Median integration guide. Also, don’t forget to leave us a comment below. We’d truly love to hear from you! Take care of popular customer scenarios with a chat bot! 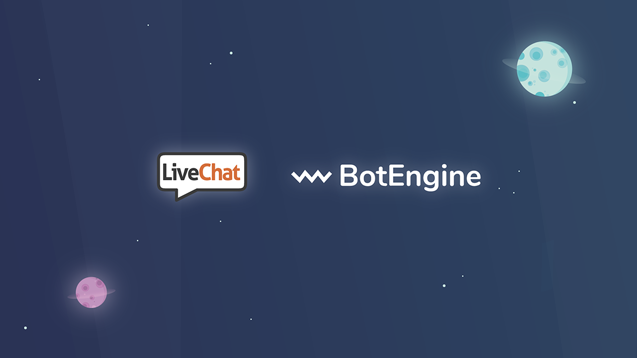 By integrating LiveChat with BotEngine, you will be able to create a bot that can take an order, schedule an appointment or answer a common question – all without your help! And when the bot faces a problem it can’t solve, it will transfer the chat straight to you. Get it while it’s hot. 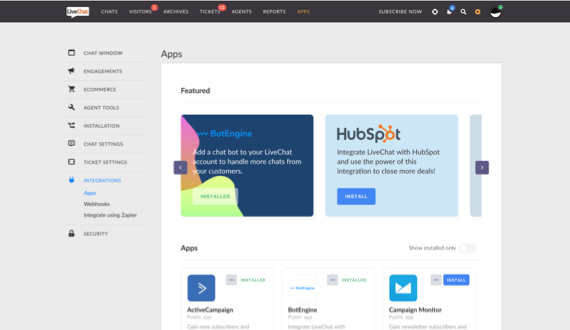 Sign up for BotEngine today and have a crack at creating your own chat bot. LiveChat for osCommerce Is Here! LiveChat for osCommerce is here! Build a strong relationship with your clients by amazing them with the excellent customer service. 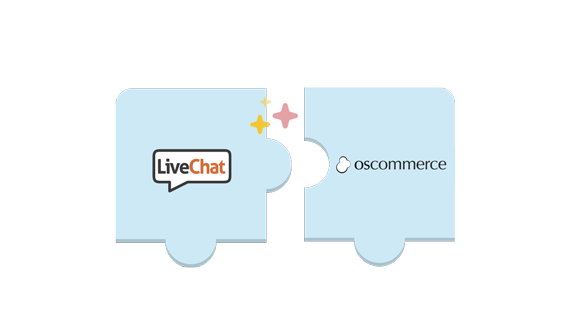 LiveChat for osCommerce will make your e-commerce journey much easier! Adding LiveChat to your osCommerce have never been easier. With no need to edit any lines of code, you can focus on what’s important – providing your visitors with excellent customer service, available on the spot! Disable LiveChat for guest users of your store. Our official tutorial is available here, so don’t hesitate to check it out. Also, don’t hesitate to leave us feedback at feedback@livechatinc.com – we’d love to hear from you! Using both Pipedrive and LiveChat? Great news! Now you can work smarter and close even more deals while chatting with your customers. All of that without leaving your LiveChat app. Pipedrive integration – what about those deals? Knowledge is power, so it always better to know more about your customers when trying to close a deal. Now, instead of leaving your LiveChat app to check your customer details yourself, we will do that for you – straight during a chat. 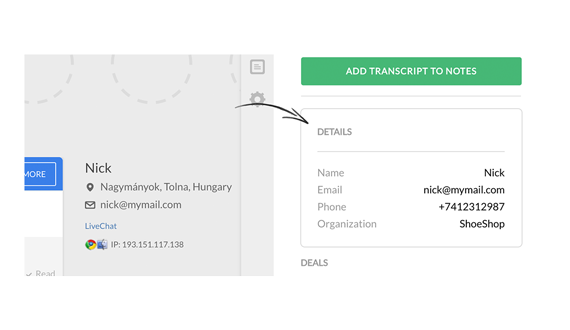 Not only that, our integration allows you to add chat transcript to your Notes. Save the vital information about your clients for later, and use them during future chat conversations! Check out our official tutorial and see how easy it is to integrate LiveChat with Pipedrive. Also, don’t hesitate to leave us feedback in the comment section – we appreciate each and every note! Build Your Chat Window with our Visitor Chat SDK! Build your unique chat window and integrate it with your product in a way you have never imagined. All of that with our brand new Visitor Chat SDK! Set up your visitor’s data. Not only that, we also took care of maintaining the chat session between you and your customer. And there’s much more to come! 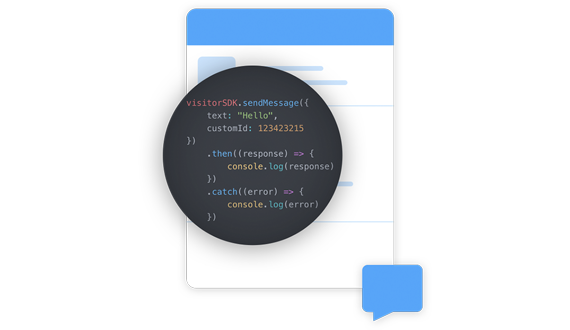 Click here to check out the full-blown documentation of our Visitor Chat SDK. Be aware though – the developer’s paradise awaits!